Hey guys! Happy Saturday! Enjoy some spam!! Orly Glitz. I picked this up on clearance because I don't have a gold polish this color! This is 2 coats. Next French Tip Dip Oceana. I won this on a Twitter giveaway (Thanks Bridget!) Oceana is a minty green with iridescent shimmer. 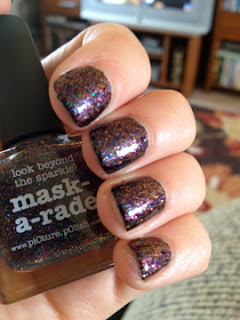 And these pictures are horrible because I am impatient and didn't wait long enough for the polish to dry. Sigh. Next, Color Club Disco Nap. This mini came in my May Birchbox. 2 coats. Hey guys! It's Friday... which I do not like this week because it means my vacation is almost over. Sigh. Siiiiiggghhh!!!! This is 3 coats, no top coat. Those darn NOPI Kardashian Kolors.... I love them. My husband brought this home for me because they just started carrying the NOPI's at his job. GLITTER!!! I used 2 coats, with 2 coats of top coat.... I should have used 3 coats. It was pretty gritty. But the polish covered very well in two coats so I was happy about that fact. The downside: both of the Kardashian glitters I have worn have chipped off in sheets after about a day.... umm, that's not cool. EXCEPT that glitter removal is such a pain, I don't entirely mind. I just wish it would last longer than a day! Essie Mojito Madness is from the Summer 2012 collection "Bikini So Teeny." Essie describes Mojito Madness as a lime green but it's much more blue green than lime green. I'd call it a darker, dusty mint green, if that makes sense. Formula wise, this was probably the best Essie formula I've ever used. I could have gotten away with one coat but I wasn't prepared for that so I used two coats. I sponged Nails Inc Royal Arcade onto the tips for a super cute glitter tipped look. What do you think? Do you have any of the new Essie polishes or new Nails Inc Jewelry Glitters? 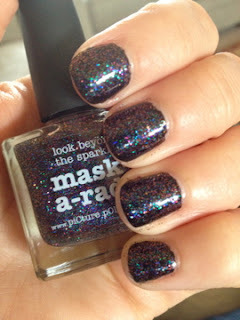 I have a Spoiled polish for you today! Spoiled Shrimp On The Barbie is a rosy coral with tons of golden shimmer throughout. It's a duochrome! I'm not big on duochromes usually but this is really pretty! I used 2 coats, no topcoat. After a few days, I found some Icing Shredded glitter and had to add to this :-) One coat of Shredded. What do you think? Do you like the addition of the Shredded polish? Hey guys! How goes it?! I'm a little bit crazy obsessed with jelly sandwiches right now and this is an unexpected one. I received Spoiled Deeper Dive in a swap... I didn't really know anything about it other than it was pretty much the only polish the person had that I wanted (aside from the main reason I was swapping) but I LOOOVVVEEEE this color! Deeper Dive is a gorgeous teal color. It will easily build to opaque in about 3 coats but it's perfect for jelly sammich's, too! On my index finger, I started the sandwich and forgot to take pictures, lol. Ring and pinky are two coats. Icing Lemme See Your Peacock over Spoiled Deeper Dive. (Index finger is sammiched already). 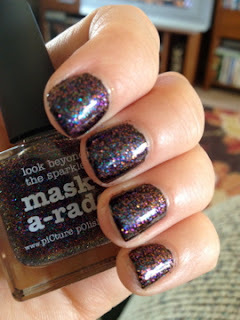 Mask - A - Rade is a multichrome rainbow glitter. 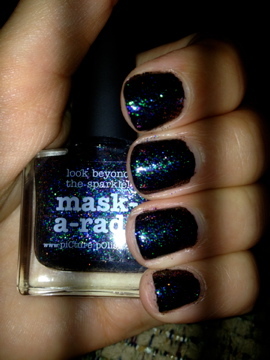 I layered 2 coats over Wet n Wild Black Creme. I should have gone outside to take beautiful pictures but... the sun was being a tool and not coming around. 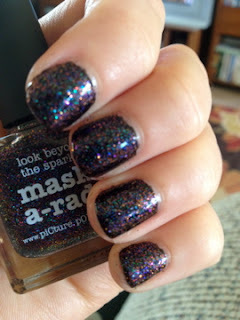 Here is my always late to the party Julep Maven June polishes! I love this quote. I'm such a rule follower sometimes, I need a reminder to not worry about it so much and take a few chances! I layered one coat of Lac Attack Jewel Of The Nile over this yellow because I'm a little obsessed with JOTN. It looks good over everything! 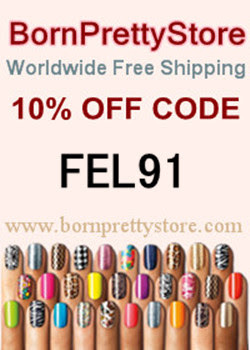 To become a Julep Maven, click here and use the code COLOR2012 to get your first Maven Box for only 1 cent!